You know what it's like as you get ready to hit "reserve" for that cruise, last-minute flight, or room at the resort. The destination ideas have been explored, the research has been done, and you're ready to book. In these let's-book-it moments, people are ready to put their dollars behind their decisions. And they often turn to search in these micro-moments. 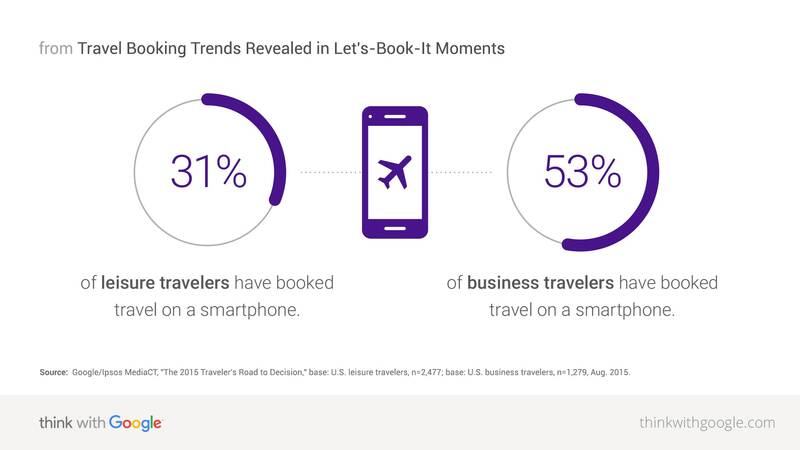 The consumer behavior in these moments is shaping travel industry trends at large, and even business travel trends. 94% of leisure travelers switch between devices as they plan or book a trip. Source: Google/Ipsos MediaCT, "The 2015 Traveler's Road to Decision," base: U.S. leisure travelers, n=2,477; base: U.S. business travelers, n=1,279, Aug. 2015. Meet Kendra. Kendra is a single mother of three who travels for both business and pleasure. In a five-month period, she planned business trips to Amarillo and Kerrville, Texas, while also exploring vacation destinations in San Antonio, Whistler, and Puerto Rico. Source: Google partnered with Luth to analyze the digital activity of its opt-in panel participants during a one-month, live-tracking study. This article details the cross-device clickstream data of one of those participants. Kendra is a pseudonym. The participant agreed to the publication of this research for marketing purposes under the condition of anonymity. Why is this happening? Two reasons: the anxiety factor and the limitations of mobile booking sites and apps. 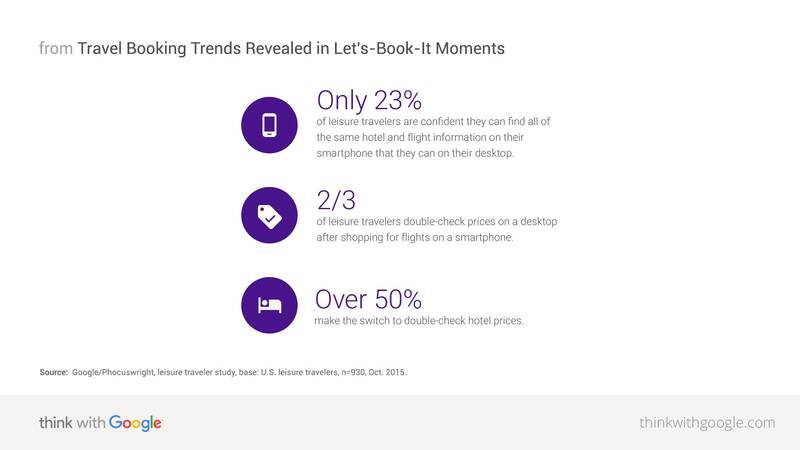 Source: Google/Phocuswright, leisure traveler study, base: U.S. leisure travelers, n=930, Oct. 2015. Source: Google/Ipsos Connect, travel playbook omnibus, base: U.S. travelers 18+ who use a smartphone, n=1,304, Apr. 2016. Offer assurances on mobile booking. 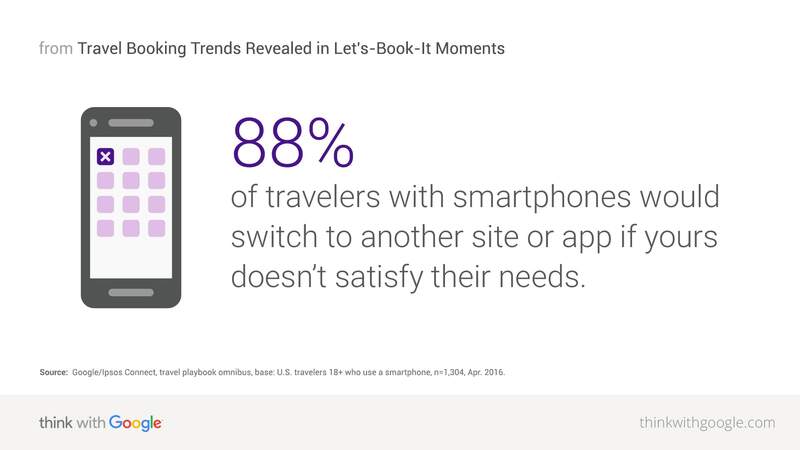 To help customers feel more comfortable booking on mobile, you need to alleviate the concern that they might be missing out on additional information just because they're using a smartphone. Allowing customers to cancel with no penalties and providing a best price guarantee are two ways that companies are tackling this issue. Help the traveler fill in forms. Provide alternatives for finishing the transaction (like click-to-call buttons). Consider using Book on Google to help travelers book a hotel or flight in a matter of clicks without leaving the search results page. Anticipate needs on mobile. To understand consumer needs, check out your top mobile searches and your most popular mobile content. Put the call to action for these primary activities front and center on your site. Virgin America is a great example of a brand that recently refocused its mobile experience on one simple call to action: "Book a flight." To make room for this single call to action, Virgin America steered away from other offers or distractions that might clutter the booking process or draw attention from that single goal. Today its mobile customers can (and do) book flights twice as fast. Meet their expectations by keeping your back end up to snuff. For help, try Google's PageSpeed Insights tool; it will rate your site's load time and offer custom recommendations for increasing your site's speed. And for more of a deep dive in creating best-in-class user experiences in mobile, check out "How to Create a Better Mobile User Experience." Consider using Progressive Web Apps to bring the best of mobile sites and native applications to users, fast. Booking.com is responding to this need by reaching out to last-minute travelers in a very deliberate way. Booking.com noticed more of its customers booking hotels on smartphones when they were already traveling, with three-quarters of same-day bookings already happening on a mobile device. To meet the needs of those last-minute travelers, Booking.com created its Booking Now mobile app. Based on a traveler's location, it shows the closest places to stay and offers a frictionless booking experience so travelers can make a reservation in just two taps. Booking.com has applied what it's learned across all of their mobile experiences—and it's seen great results. 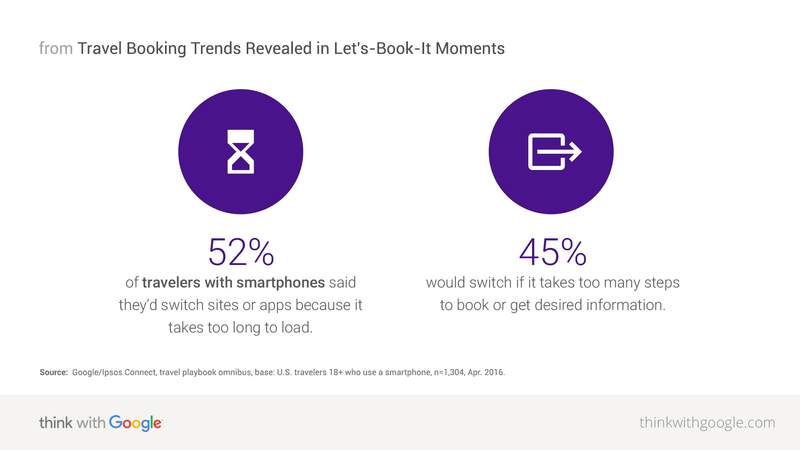 As of May 2016, more than a third of reservations are made through mobile and the company anticipates mobile bookings will make up the majority of their reservations as soon as next year. There's a lot more to learn. 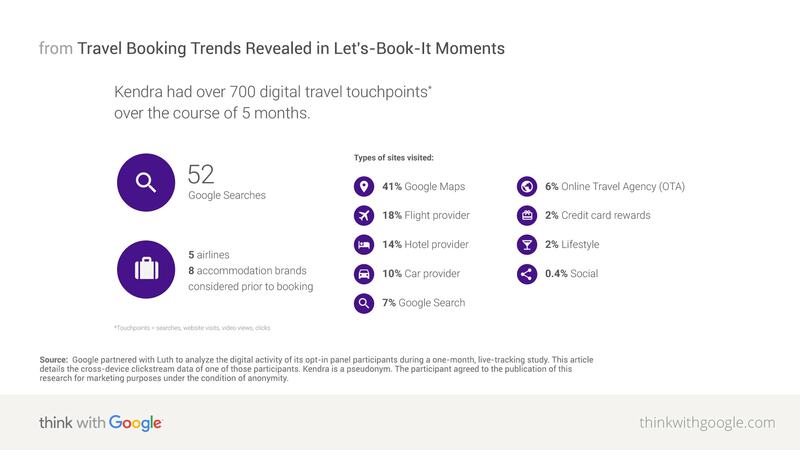 Check out this more detailed feature on Booking.com's approach to let's-book-it moments, including a video complete with interviews from the people driving this thinking for the brand. Don't manage your call center with a one-size-fits-all approach. While 75% of leisure travelers who shop for hotels on their smartphone typically end up purchasing on a desktop or laptop computer, people also call a travel provider to book.8 Over one in three mobile travelers who have researched travel on a smartphone, then called to book or to get more information.12 That's where brands like the hotel booking site Reservation Counter are finding success. Reservation Counter has been able to more fully capitalize on mobile calls as a conversion channel. Its best-in-class call center allows the company to learn about customer behaviors, upsell repeat visitors, and give priority in the call queue to the customers with the highest likelihood of driving a booking. In addition, priority is given to calls from higher-converting geos and properties, along with a higher basket value. At the beginning of 2016, Reservation Counter launched a mobile pilot for its top-converting properties by drastically increasing its mobile bids and using click-to-call extensions. Within weeks, it saw mobile conversions for these ad groups increase by 260% month over month, and it saw a 4X increase in offline sales via click-to-call. 1 Google Data, U.S., Mar. 2016. 2 Google/Ipsos MediaCT, “The 2015 Traveler's Road to Decision,” base: U.S. leisure travelers, n=2,477, Aug. 2015. 3 Google/Ipsos MediaCT, “The 2015 Traveler's Road to Decision,” base: U.S. business travelers in 2014, n=1,220; base: U.S. business travellers in 2015, n=1,279, Aug. 2015. 4 Google Hotel Ads Data, U.S., Feb.–Apr. 2016. 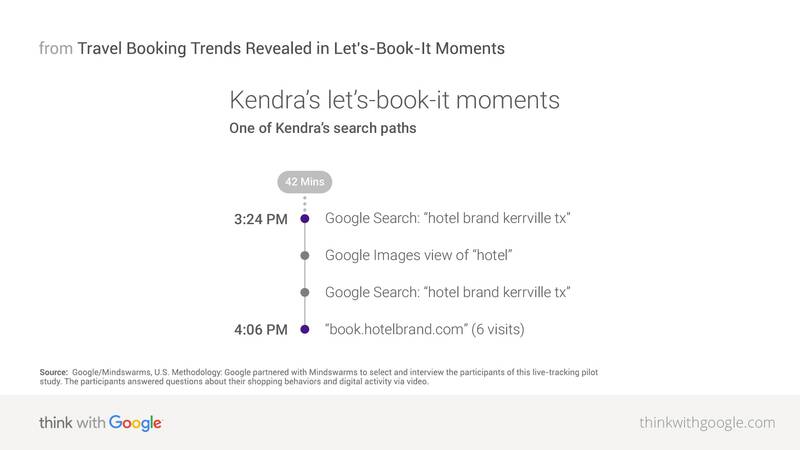 5 Google Hotel Ads Data, U.S., Feb. 2015–Apr. 2016. 6 Google/Ipsos MediaCT, “The 2015 Traveler's Road to Decision,” base: U.S. leisure travelers that own 2+ devices, n=768, Aug. 2015. 7 Google/Ipsos MediaCT, “The 2015 Traveler's Road to Decision,” base: U.S. leisure/business travelers, n=1,330, Aug. 2015. 8 Google/Phocuswright, leisure traveler study, base: U.S. leisure travelers, n=930, Oct. 2015. 9 Google/Ipsos MediaCT, “The 2015 Traveler's Road to Decision,” base: U.S. leisure/business travelers, n=599, Aug. 2015. 10 Google/Ipsos Connect, travel playbook omnibus, base: U.S. travelers 18+ who use a smartphone, n=1,304, Apr. 2016. 11 Google Internal Data, U.S., Mar. 2016. 12 Google/Ipsos Connect, travel playbook omnibus, base: U.S. travelers 18+ who have done research on their smartphone, n=890, Apr. 2016.